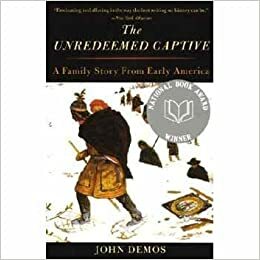 John Deemos' "The Unredeemed Captive" deals with the adoption of Eunice Williams by Indians at a time when the Puritan settlers of New England Colonies did not get on with their neighboring Indians. It discusses the Puritan's stereotype views of the Indians and how the only way to 'redeem' oneself if captured was by escape or by being freed. It tells the story of Eunice's capture and evaluates how this stereotype only increased Eunice's repulsion of how her father viewed the Indians,. making her adopt their way of life and marry an one of them and thus remaining "unredeemed". This page was last modified on 17 January 2018, at 23:57.